IVO-JAN VAN DER WERFF has attained accolades as a chamber player, recitalist, guest artist and teacher throughout Europe and North America. As a member of the Medici String Quartet for 28 years, Mr. van der Werff has performed in over 2,000 concerts in major festivals and venues world wide, broadcasting regularly on radio and television. The Medici quartet made more than 40 recordings for EMI, Nimbus, Hyperion and Koch, and won many awards for works ranging from Haydn, Britten, Janacek, Schubert and the Beethoven cycle to more eclectic works of Saint-Saens, Wajahat Khan and Nigel Osborne. The quartet had collaborations with many artists across the musical, literary and theatrical spectrum including the Royal Shakespeare Company, George Martin, Alan Bennett, John Williams, John Thaw and Jack Brymer. Mr. van der Werff has performed as recitalist in New York, New Zealand and Hong Kong as well as numerous venues throughout the United Kingdom. His recordings for ASV and Koch include the sonata by Max Reger and the complete works for viola and piano/harp by Arnold Bax. A new recording of works by Al-Zand, Shostakovich and Britten is due for release in November 2014 on the Guild label. Mr. van der Werff is often invited to perform with quartets and chamber ensembles throughout the United Kingdom and Europe such as the Alberni, Coull, Bridge, Redcliffe and Adderbury. 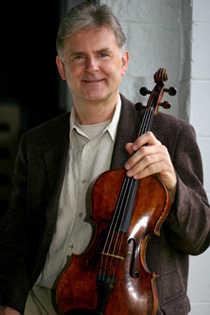 Mr. van der Werff has been a professor of viola and chamber music at the Royal College of Music in London and is now a full time professor of viola at Rice University. He has developed a private viola program near London and is director of the ‘Catskills Viola Retreat’ in Upstate New York. He has taught at summer schools such as Dartington and Oxford in the UK, Schlern in the Italian Alps, in Sweden, at the Texas Music Festival, Domaine Forget and Madeleine Island in the USA and has also been an adjudicator on many competition juries. Mr van der Werff has given masterclasses all over the world at schools such as Eastman, Colburn, Vanderbilt and Santa Barbara in the USA, Trinity College, the Royal Northern College and the Royal College in the UK, the Royal Academy in Stockholm, the Hong Kong Academy for the Performing Arts amongst others. Many of his former students hold principle and regular positions in orchestras such as the BBC Symphony, Philharmonia, London Symphony, English Chamber and English National Ballet as well as orchestras in Spain, Portugal, Norway and France. For many years he played in London studios on literally hundreds of sound tracks for film, pop and tv ranging from Harry Potter and James Bond to Madonna and Maria Carey to Pride and Prejudice and Doctor Who. In 2011, inspired by his viola mentors--Margaret Major, Peter Shidlof and especially Bruno Giuranna—Ivo-Jan van der Werff published a book entitled ‘A Notebook for Viola Players’ which consists of a series of exercises and explanations on and about viola technique.